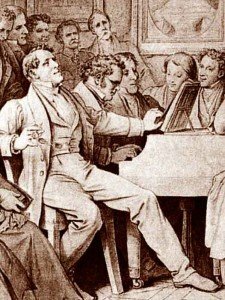 Why Schubert & the Piano at BEMF….? Christopher Greenleaf, with Sylvia Berry, Clara Rottsolk, and Stephen Porter, are the main participants in “Schubert & the (forte)piano, the performer’s perspective.” The symposium and two concerts, a BEMF Fringe Event, will be held from 9 am to noon on Thursday morning, June 16, at First Lutheran Church, Boston. The following is excerpted from the program notes. The piano repertoire of the 19th century performed on period originals or on their increasingly convincing replicas has long figured in early-music festivals around the world. We in the States, though, have not yet moved in this direction on a broad enough front to unleash a staying trend. Thus Schubert & the Piano. Our concert-symposium-recital sandwich is unlikely to change our views on the matter but is among the initiatives cheerfully exploring the possibilities. Imagine a festival able to “dish up” (thank you, Percy Grainger) the Schütz Exequien, 14th-century Aquitanian lais, Homilus’s glorious little 1750s Motetten…. and Chopin Nocturnes on a seductive 1840s Pleyel, this composer’s preferred model! Sylvia appears as a fortepianist, a specialist breed championing the questing, eagerly explorative encounter between highly gifted musicians, the very keyboard instruments that first launched the repertoire, and a public who always wind up being pleasantly blown away by the breathtaking beauty and untrammeled expressivity brought to bear on music they are quite startled to realize they didn’t know well enough at all. To afford our argument something resembling fair-mindedness toward the dominant piano of our day — the modern concert grand, pianist Stephen Porter confronts the task of presenting Schubert credibly and with convincing effect on an “ancestor” instrument, for this concert, Rodney Regier’s “Grafendorfer” piano, modeled after Viennese originals by Conrad Graf and Ignaz Bösendorfer. Both he and Berry bring compelling musical personalities and abilities to the fray, making less for comparisons between them (certainly not my goal in getting this BEMF Fringe event off the ground) than for manifest proof of the fact that exceptional musicians make exceptional music — though so much more enjoyably on the right instruments. To muster what a Schubert-era piano can or cannot do with the Lied, as compared with today’s less poetic, three-legged behemoths, will be demonstrated by Clara Rottsolk’s fine way with Lieder, for which the music-loving heart harbors such powerful affection. Veteran recording engineer Christopher Greenleaf collaborates with chamber, early, and keyboard musicians in natural acoustic venues on both sides of the Atlantic. His principal mission is recording surviving historic instruments and their successful copies in supportive, affectively engaging acoustics. He is active as a writer, translator, photographer, and acoustic consultant. Comments Off on Why Schubert & the Piano at BEMF…. ?